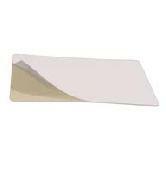 Wipaq offers the one common basic product for a range of uses and is called as the adhesive card which can adhere to any hard surface like PVC and others. This is used in the manufacture of ID cards, smart cards and other identity tools in high quality. It is very versatile that even the debit and credit cards also are fitted with this material.